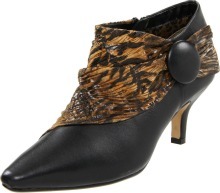 Tiger print bootie from Bella Vita. Bella Vita, which means “beautiful life,” is contemporary lifestyle footwear created with attention to fit and comfort while keeping current trends in mind. Attention is given to size and width and in styling from casual to special occasion.